And a chef who accidentally created a puffed pork legacy. In a professional kitchen, Sundays are the worst. All the guests want to sneak in a night out, but they don't want to eat late, because there’s work and school to worry about in the morning. That means everyone tries to eat at 5 pm. As a cook, you spend your entire night sprinting from the get-go, and by the end of the night you’re left crumpled in the dry storage room, bewildered, realizing that in a few hours you’ll have to prep your entire station from scratch. Ten years ago, I was elbow-deep in one such service when a gift arrived at the pass. It wasn’t the usual 12-pack of Tecate or a bottle of crappy bourbon—it was a bag of light, fluffy 4505 chicharrones. I had only ever heard of these mythical chicharrones; they were only available at certain bars, and even then, they were usually sold out. I had made special trips to bars across town trying to track down these crispy brainchildren of the wildly talented Chef Ryan Farr (who made his name at Fifth Floor working with Melissa Perello, and as the opening chef of Orson, working as chef de cuisine for Elizabeth Faulkner)—but here they were, overflowing in a brown shopping bag. My first bite, taken between pick-ups crouched in the pastry station, inspired equal parts disbelief and bewilderment. 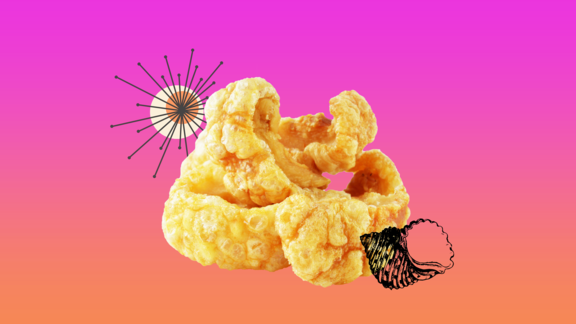 4505 chicharrones are impossibly light, with a bracing crunch and a subtle porkiness. The collagen melts in a far more luxurious way than the average pork rind. They’re salty and mildly sweet, and in about 15 seconds you’ve managed to eat an entire bag. In five more seconds, you start thinking about having another one. There’s something that’s kind of cool and also mildly gross about eating a bag full of animal skins. They’re the snack your mom steers you away from, a perfect complement to a beer-filled afternoon. That smell when a pork chop is just about done cooking, when its fat sizzles and pops? That’s chicharrones. When they’re done poorly, they can break teeth and drip with a mess of fryer oil and pork fat; too much leftover meat attached to the puffed, crackly skin is a textural nightmare. Done well? Well, you eat another bag. 4505 began as a single Weber grill set up outside local bars, cooking homemade sausages and burgers, before appearing as a wildly popular farmers market stand. It then morphed into a sustainable, whole-animal butcher shop, which then grew into a barbecue joint with a line that stretches to the end of the block. The reason whole animal butchery suddenly became cool in 2011? 4505, and Ryan Farr. Eventually, I came to befriend Ryan, and in a very short amount of time, he bestowed upon me: whole animal butchery skills; cooking techniques for said whole animals; coping mechanisms for dealing with a rush of 400 customers at a damn farmer’s market, and several hangovers. Lucky for us, I’m very patient. Farr began experimenting with chicharrones as a way to use every last bit of the whole animals at Fifth Floor. While the traditional method of making pork rinds or cracklings—cooking them in their own lard—is already incredibly sustainable, the 4505 chicharrones technique has a few more cheffy bells and whistles. First, the skins are cut into strips and cooked sous-vide for anywhere 24 to 48 hours, depending on whether they’re cooked with an immersion circulator or in a combi oven. They’re then cleaned of any extra fat and collagen, and dried for another 24 hours. The one secret he will admit to is 4505’s frying process. “We fry them in rice bran oil, which [gives] them a unique texture and cleanliness,” he explains. The way they suddenly burst upon frying means you actually gain volume upon cooking rather than losing it. Finally, they’re seasoned with salt, chiles, and just a hint of sugar. There’s nothing else like them out there, and they’re about to get much easier to find outside of the city: 4505 is destined for Whole Foods shelves all over the country. Let America's best pitmasters clear the hickory-smoked air, courtesy of our partners at Tasting Table.